Report on the investigation of possible crane habitats in Ireland. The Golden Eagle Trust of Ireland invited members of the Swedish Crane Working Group (SCWG) to visit Ireland in 2011 to look at the potential for a Crane release programme. The visit took place on July 27-31. The first days were designated to Bord na Mona owned bogs, in different stages of harvesting and also to some locations where peat bog restoration was undertaken. During the last days we visited several areas in the Counties Roscommon, Longford, Leitrim and Cavan. Our field experience of cranes mainly has it origin in an area in southwest Sweden, where the breeding density of cranes is high to Swedish standards, and where we have conducted studies on cranes for roughly 20 years. Cranes need a suitable nesting place and feeding territory to be able to successfully breed and raise young. The nest, which is made of vegetative material, is placed where it is surrounded by water to make it more inaccessible for mammal predators, mainly foxes and badgers. If water level gets lower during incubation the breeding often fails. Cranes have some ability to defend the nest against predators, but dry and warm weather during incubation leads to many failed breeding attempts. Cranes may breed relatively close to human settlements, but this seems to be due to differences in individual crane behaviour. Even so, cranes are often extremely secretive when incubating. A relatively undisturbed habitat is essential, however to what extent depends upon the individual pair. The feeding habitat must be able to support the newly hatched chicks with accurate food items close to the nest for the first days in life. The adults can serve the chicks food items, but as the chicks are small they cannot move far from the nest, i.e. food must be found near the nest. As the chicks grow the family may move further away from the nest, and when 5-6 weeks old (at the size of a heron) they can be found 1-2 km from the nest. The family normally returns to the nest in the evening and spend the night there, provided that it still is a safe place. If food availability is scarce where the family is, one of the adults can leave the rest to feed on a better place. The other adult stays with the young. During growth crane chicks need protein. Cranes are quite opportunistic in the choice of food. Many kinds of invertebrates constitute the majority of food items, but when available also frogs and rodents are taken. In July, when the young cranes usually are more than 6 weeks old, berries, not the least blueberries (Vaccinium myrtillus), are important. However, the single most important food is probably earthworms (Lumbricidae), which can be found when rainfall has made it possible to find them on the soil surface. Crane families searching for food can be observed in cultivated areas, especially when grass has been cut for ensilage or hay. In heavily fertilized fields the vegetation seems to be too dense and food items are more difficult to detect. When the young are able to fly at 9-10 weeks of age, they still often stay in their territory if food requirements are good until migration starts. Other families may join other cranes in autumn groups that are visiting suitable feeding locations, such as harvested cereal fields. Peatbogs are not common as breeding places in Sweden, although it often was stated so in literature. The edges of the bogs however, with a wet fen, can provide a suitable nesting place. The shore of a small, slowly running, stream, or of a lake, often quite small, are preferred nesting habitats. The nest should be concealed within vegetation, and is rarely easy to detect. During our visit to Ireland we could recognize many places that fulfil these requirements. The restoration of cutaway Bord na Mona bogs should provide good possibilities to create suitable nesting sites. In Sweden several crane pairs have readily accepted newly constructed ponds on farmland as nesting sites, which show the great adaptability in cranes to respond to and take advantage of man-made habitats. Food availability in the Irish habitats we visited is difficult to assess. At some Bord na Mona locations (i.e. Ballycon, County Offaly) we had the impression of food scarcity because there were very few birds, even if the time of year was taken into account. At the restored bogs at Boora/Blackwater (County Offaly) the vegetation at several places looked too dense to serve as good feeding areas. The possibility to create habitats suitable for cranes and other bird species, when restoring peat bogs, provides good conditions for establishing a breeding crane population. We suggest computer simulationsto produce images of how the wetlands will look after the restoration. Then it may be possible to identify possible improvements or changes to the models. 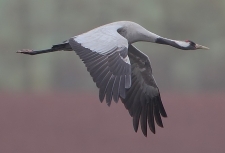 Areas in question are large enough to hold several breeding pairs, which is important as cranes normally find their future territories not far from their natal area. And because of this we suggest thatcranes should preferably not be released in an area that often gets flooded. When the first phase of reintroduction is over there seem to be many areas in the counties visited that should be suitable for cranes. The possibilities of the crane once again becoming a breeding bird in Ireland looks promising.